Our smallest shock covers are designed for use on quarter midgets. Our shock covers are designed to improve appearance and protect your shocks from the elements. These covers are available with graphics or in solid colors. If you would like your covers created with your name, number, sponsors name or some other graphic. 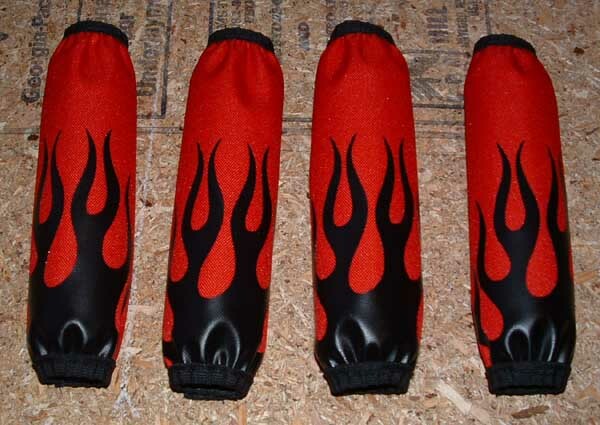 Check out our custom quarter midget shock covers. Put your racer's name, team name or a sponsors name or logo right on your shock covers.|click here| to get a quote on a custom set of quarter midget shock covers..